How would you like to be remembered? In this letter, we have an example of what may be the best type of Irish Memorial – the type where a song or poem is recorded about your character and exploits. Although, the end result may not always accurately reflect how you lived! Céad Míle Fáilte – and welcome to your weekly Letter from Ireland. How are things in your part of the world this week? Before going on, we’d like to extend a “go raibh míle maith agaibh” (pronounced “gu rev meela mah a gwiv”) – that’s Irish for a very big “Thank You” for being part of our Letter from Ireland each week. I’m having a cup of Barry’s tea as I write – and I do hope you will join me with a cup of whatever you fancy as we start into today’s letter. One Type of Irish Memorial. This was the final resting place of a man who became the subject of a famous Irish song that was sung in the bars across Munster and further – and usually manys the winning Gaelic Match. Before we share the song with you, let’s have a look at the very Irish name of this man – and the curious way in which he achieved such immortality in song. An Old Irish Name – Maybe One of Yours? Do you have any Timothys in your Irish family tree? The name has been popular across Ireland for many centuries – but especially in the most southern counties of Ireland. You see, it is an anglicisation of a much older Irish name which would have been in use right up to the 1600s. That name is “Tadhg” (try saying “Tiger” without the “er” and you have it) which comes from the very old Irish for a “Poet” or “Storyteller”. Like many old Irish names, it fell out of favour from the 1600s and was replaced with a number of anglicised versions such as Timothy, Tim, Timmy – as well as the Greek name Thaddeus (which also became Thady or Thade). “Tadgh” also worked it’s way into a number of Irish surnames such as “Teague”, “Tighe”, “Tigue” and many more. Are any of these in your Irish family tree? This ancient name has come back to popularity in Ireland and is climbing in popularity every day. So, if you have any Timothys, Tims, Timmys, Thadys, Thades or Tades in your Irish family tree – then rest assured there was probably a “Tadhg” or two further back the tree that anglicised over the centuries into one of those names. A Different Type of Irish Memorial. 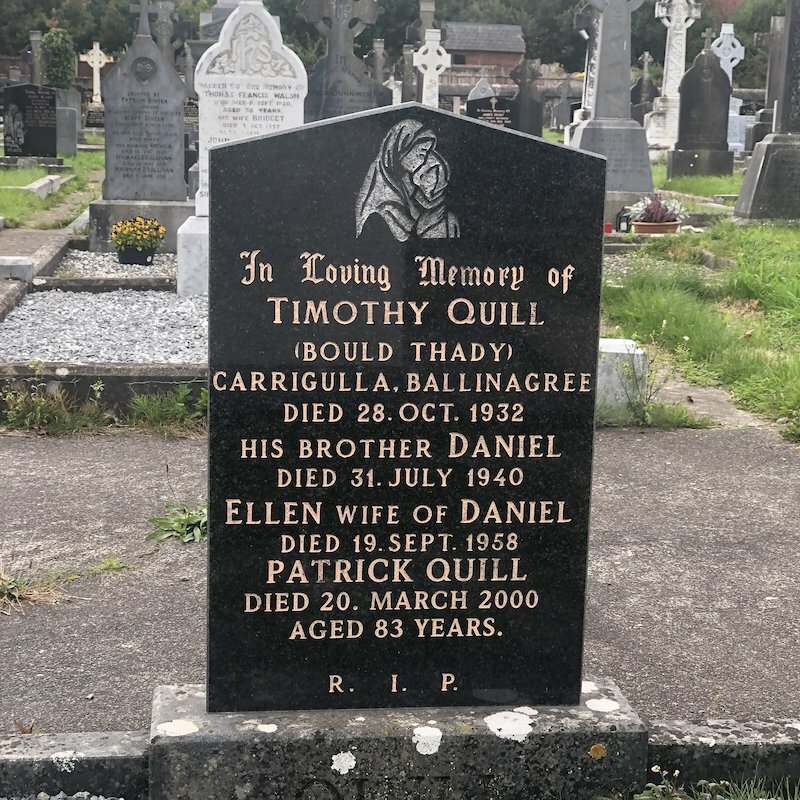 Thady “Timothy” Quill was born in the north of County Cork in 1860. He was a farm labourer and remained a bachelor all his life. Although he liked a a good sporting game, he wasn’t one for playing himself. He was also a tee-totaller and his habit of sleeping in the barns made it difficult for a refined lady to spend more than a few minutes in his company. He once worked on a farm for a man called Johnny Tom Gleeson who fancied himself a bit of a balladeer – often writing ditties that lampooned his neighbours (an old tradition among the bards in Ireland). You could say he was a bit of a “Tadhg” (poet/storyteller). He liked Thady Quill and wrote a song featuring Thady as a beer-swilling, lady-loving sportsman – the exact opposite of the real man. Now, you might imagine that Thady was offended – but he was delighted with the attention and notoriety the song provided to him right to the end of his days. However, it never did help him find a wife – I guess many ladies felt they would never rise high enough to be in his league! How about you – would you like to be remembered in such a manner? Maybe one of your ancestors had a song written about them? Please do leave a comment below and let us know! That’s it for this week. As always, do feel free to leave a comment if you would like share a story or the Irish surnames in your family.